I started my professional life as a metal worker and subsequently studied mechanical engineering. After 47 years of employement, I retired and turned my hobby into a new career. Ever since I can remember, I worked with wood in my leisure time. Not surprisingly, the tools I am most interested in are woodworking planes and saws. 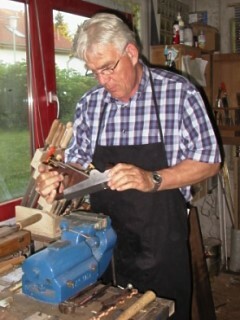 So in 2005, I started to produce my own hand-crafted hand planes in the style of the famous Norris and Spier tools in my workshop.